Ok ok ok, I know – lots of people are saying that it’s the biggest pile of garbage out there. But I have to say that after seeing Indiana Jones & The Kingdom Of The Crystal Skull tonight with Katherine & several of our friends – I left the theatre pretty satisfied with the movie. 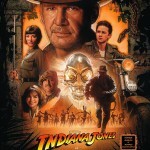 I enjoyed the movie & found it to be a totally good popcorn flick as the next chapter of Indiana Jones. Of course a lot of it was over the top & pretty far-fetched, but then again so is every other action movie that ever came out of Hollywood. Not to mention the daily news too! Hahaha – real (And Honest) journalism on the 10:00 o’clock news…. If you’re looking for a movie that will take you away with some good action, comedy & light fun – then this is it. But if you’re looking for a movie that will take any awards, then this is not for you. Have a super Memorial Day weekend & I hope you get to enjoy some delicious BBQ too – cheers!